Alderman John Arena (45th) has relocated the Feb. 9 community meeting on a proposal for a seven-story affordable and low-income housing project at Northwest Highway and Milwaukee Avenue. Plans had called for the meeting to be held in the community room at the 16th (Jefferson Park) Police District Station, 5151 N. Milwaukee Ave., but some community groups had raised concerns that the room, whose capacity is about 100, would be too small. The new location is the Branch Community Church, 6125 W. Foster Ave., which can accommodate about 280 to 300 people, according to Arena’s chief of staff Owen Brugh. The meeting will start at 7 p.m. Thursday. News of the project has generated interest in neighboring wards. “We have a lot of calls, and a lot of residents advocating opposition to it,” 41st Ward Alderman Anthony Napolitano’s chief of staff Chris Vittorrio said. It is hoped that Arena will consider holding a second community meeting open to anyone, he said. Residents are worried about the impact of low-income housing on the Northwest Side and about the project’s density, including its effect on overcrowded schools, Vittorio said. In addition, he said, Napolitano’s office has been fielding inquiries from “a lot” of 45th Ward residents who are asking how they should go about opposing the project given that Arena has been advocating on behalf of the plan. Jefferson Park Neighborhood Association president Robert Bank said that there are residents in adjacent wards who live closer to the development site than several parts of the 45th Ward and that it does not make sense to ban them from the meeting. He said that residents who live within a mile of the site should be admitted regardless of their ward. The 67,000-square-foot site was once home to a food processing plant, and a construction permit was issued last year to convert the existing facility into a self-storage warehouse, but Arena had the site rezoned to stop the project. Arena has said that storage facility by itself there would do little for the economic vitality of the area. LSC Development is now proposing to build a five-story warehouse on the northern end of the site and then to sell the southern half of the parcel to a residential developer. The current proposal by Full Circle Communities calls for the project to include 60 affordable units, which would be offered at below-market rents to those earning about 60 percent of the area’s median income. Under the proposal veterans would be given preference over other applicants. Between 20 and 28 units would be referred from a Chicago Housing Authority-subsidized program. Those tenants would be taken from a CHA waiting list for low-income families and would be subject to a screening process which Full Circle conducts on all prospective tenants. Full Circle interviews all tenant applications and conducts financial and criminal background checks. Full Circle does not accept convicted tenants. The CHA component of the project would be separate from the authority’s Section 8 voucher program, whose participants can use the rental payment voucher at apartment buildings throughout Chicago. About half of the 100 apartments would be three-bedroom units, with the rest being a mix of studio and one- and two-bedroom units. Monthly rents are projected to range from about $300 to $1,900, and the tenants who qualify for the below-market rents would be paying no more than 30 percent of the annual income for rent. Arena said that the Chicago Plan Commission is scheduled to consider the proposal at its meeting on Thursday, March 16, but that the focus of the meeting would be the warehouse component of the project. The proposed development ordinance for the project is divided into two sections, and that Full Circle or any other prospective developer for the residential portion of the project would return at a later date for approval of its plans. Currently on the project’s zoning application, which was introduced in the form of a development ordinance at City Council last month, states that the proposed underlying zoning of the project would allow a maximum of 186 residential units, including 55 efficiency apartments, on the southern half of the site. Full Circle is seeking to build a smaller project than that. It could take Full Circle up to a year to obtain financing and tax credits for the $30 million project, Arena said. If Full Circle were to run into obstacles, another developer for the site would be sought, he said. Arena has expressed support for the project. “I am proud to help usher in this new development in the 45th Ward with special space reserved for veterans and those with disabilities,” Arena said in a news release. However, the proposal has sparked controversy on social media, as there are two online petitions against the project. The Jefferson Park Neighborhood Association opposes the project. Association member Steve Neidenbach said that project would add to the density of the area, creating problems for residents. “Let’s face it. Within a four to five block area you’re adding 400 to 500 apartments,” he said in reference to current projects and some anticipated proposals for Jefferson Park. Arena has said that increased density would help revitalize the struggling Jefferson Park business district. 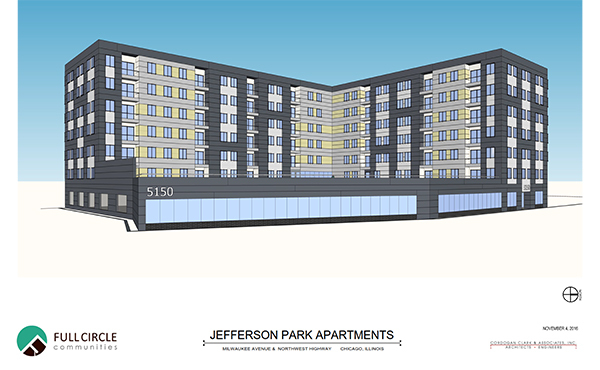 Full Circle’s proposal would be the fourth major apartment building planned for the area, where a 15-story building is expected to be constructed next to the Jefferson Park transit center. Opponents have said that some of Full Circle’s suburban developments have had a lot of 911 calls for police service and that the project’s density could be a further strain on area schools. Others have said that the planned 62 parking spaces would not be enough. Project officials have said that tenants earning about $45,000 a year, similar to what typical renters in Jefferson Park earn now, would occupy most of the affordable-designated units.